Demand asymmetry is a fourth asymmetry: the client-customer’s experience always leaves him or her with something more to be desired. It means that a client-customer’s demand can never be fully satisfied – there will always remains a value deficit. The assumption here is that, however hard a client-customer tries to bring into consciousness what it is that s/he needs, s/he will never be able to say all of it – there will always be a deficit. This deficit may not be apparent until a supplier tries to respond to the client-customer’s demand, when the ways in which the product/service supplied is experienced as falling short of what was hoped for – the client-customer experiences a value deficit. Examples of value deficits would be: the veterinary product didn’t make the owner’s dog better; the patient’s condition remained chronic after all those treatments; the minister’s congregant remained unconsoled despite his or her ministrations; the equipment did not perform as command expected once it was deployed in the field; the citizen felt that s/he had been duped by the government; the meal did not measure up to expectations; the performance didn’t manage to pull it off; etcetera. In each case the need is experienced by an embodied subject who has tried to articulate, with the help of others, what it is that he or she wants. The situation in which the need is experienced is a demand situation. An effects ladder is a way of unfolding as much as possible about the nature of the situated behaviors that, together, are expected to meet the needs of the demand situation. The situated behaviors are customer situations that can be addressed by value propositions. In one-by-one consideration of a client-customer’s demand, we are formulating strategy at the edge: we are asking what is needed to address the demand situation of the active client-customer within his or her particular context-of-use on a sustained, through-the-life-of-the-relationship basis? The effects ladder provides a way of thinking through what this involves. It starts with the demand situation in the client-customer’s problem domain – the client-customer’s context-of-use in which s/he is seeking to create value and/or to reduce a value deficit. 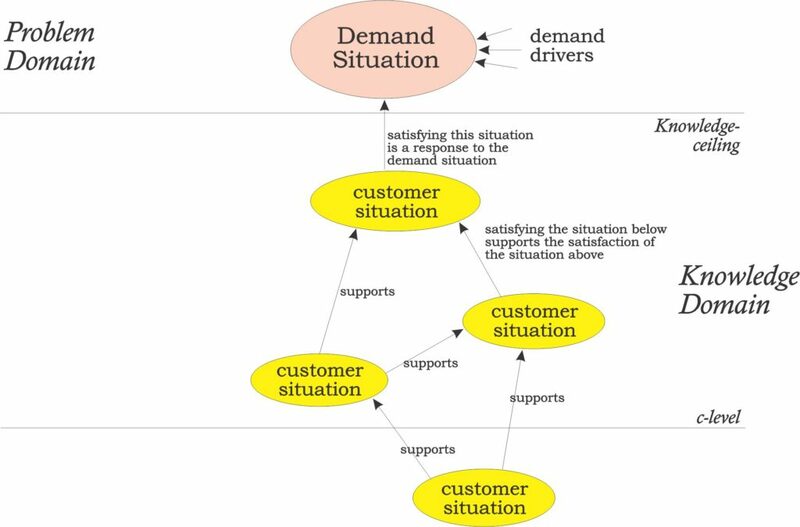 In this problem domain, the client-customer’s demand situation is defined in terms of drivers. These drivers are the ways in which the client-customer experiences the situation in terms of pain/pleasure. For example, the owner of a much-loved dog wants to make sure the dog receives all possible care as an important part of his or her life. It is important to note, here, that drivers reflect the way an embodied subject experiences the demand situation. 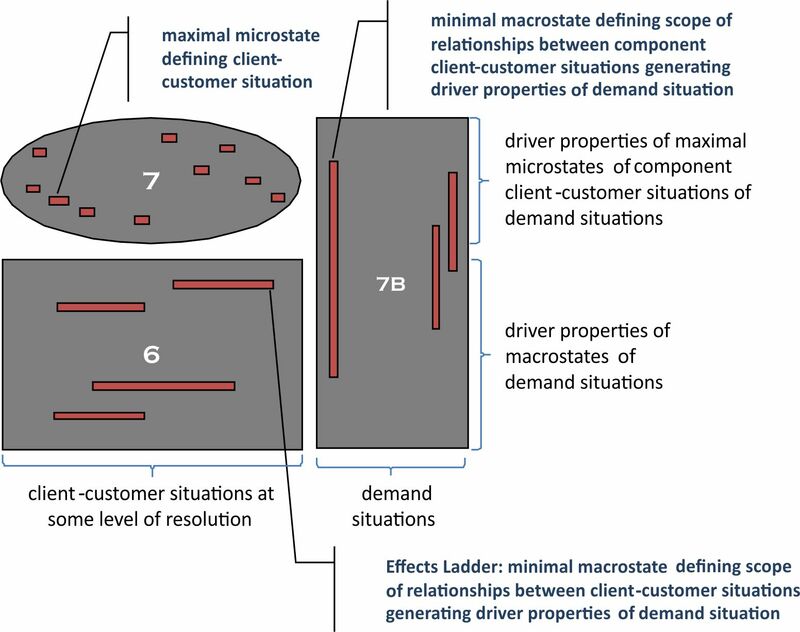 The driver properties desired by the client-customer in the form of demand situations are novel forms of emergence (Matrix 7B) brought together from component client-customer situations (matrix 7) in the form of an effects ladder (matrix 6). These matrices 6-7-7B then form the context-of-use into which value propositions must be delivered one-by-one. The effects ladder will itself be a hypothesis (a P-type proposition) about how the needs of the demand situation may be met, so that the experience of its composite effects will be constitutive of a novel emergence in the embodied experience of the subject(s) on whom it is producing its effects. This embodied experience will itself leave a value deficit. Note that for the client-customer, the demand situation is what is being experienced ‘on the surface’, while its constituent situations involve the client-customer reaching deeper into their experiencing to distinguish its different aspects. This relation of surface-to-depth is captured by the relation of matrix 7b to matrices 6 and 7. The next posting will describe the processes of alignment and supporting platform needed to deliver value propositions into this context, giving rise to the first kind of value deficit above. The technology is not the product. The business is not the customer’s solution. The customer’s demand is not the customer’s experience. The customer’s experience always leaves him or her with something more to be desired. These can be read back onto the psychoanalytically-based dilemmas of ignorance: (top-down vs bottom-up; espoused theory vs theory-in-use; affiliation vs alliance; object vs sinthome). For large-scale cases considering the implications of through-life management, see meeting the challenge of health care reform, valuing agility through a demand-led approach to capability management and managing the system-of-systems value cycle. These are all cases involving the need for ‘type III’ agility. See rcKP – value propositions at the edge. For more on these different kinds of value proposition, see value propositions at the edge. Note that this will be a fourth kind of novel emergence, the third being of the processes of alignment needed to deliver value propositions.